Coffee shops differentiate themselves from other places that use lots of coffee – such as offices, churches, and the military – because, in addition to brewing coffee in high volume, coffee shops need to offer their customers high quality coffee. In order to brew high quality coffee, a brewer must brew at the correct temperature and brew in such a way as to get the optimal flavor extraction from the coffee. After brewing, there must be a way to keep the coffee hot without scorching the coffee. Containers that require an external heat source, such as a coffee pot or urn, should not be used in a coffee shop. That said, one of your top considerations when opening a coffee shop should be investing in the best equipment possible. Depending on volume needs, either a single or twin brewer may be better for meeting volume demands. Depending on your preferences, either an airpot brewer or a thermal dispenser would work. The twin brewer can brew 15 gallons/hour. Brews in half-gallon batches into airpots. The airpots will keep the coffee hot for a few hours and can be self-serve. The brewer has pre-infusion or pulse brew for getting optimal flavor extraction from the coffee. Single head can brew 3.9 to 11.8 gal/hr depending on electrical configuration. Large spray disc and pulse brewing intermittently sprays water over the coffee grounds for maximum saturation and flavor extraction. Pre-wet cycle that saturates the grounds before brewing. 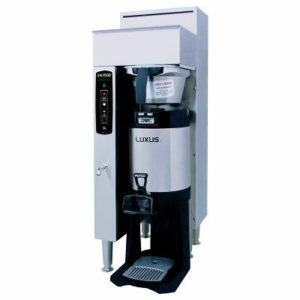 The CBS-2041e brewer brews in 1 gallon batches directly into a Fetco Luxus L3D Thermal Server. After filling, the server can be moved to where the coffee will be dispensed – either behind the counter or out where customer can serve themselves. There are many variations in sizes and brands that you should consider when choosing a coffee maker for your coffee shop, and we are happy to help you make the best decision for your needs.